This past weekend, needing a bit of zombie killing in my life, I joined some friends at a local arcade to spend some time with Left 4 Dead Survivors. Honestly, I wish I'd just stayed home and played Left 4 Dead 2. Left 4 Dead Survivors is largely a port of Left 4 Dead 2 with the levels (currently Dead Center, Dark Carnival, Swap Fever, and Hard Rain) and the vast majority of the weapons coming directly from that game. 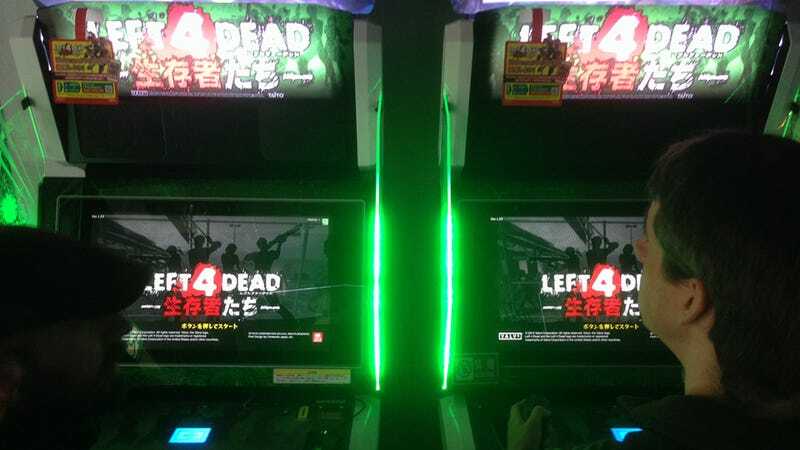 Like the PC/console versions of the game, Left 4 Dead Survivors's main focus is on co-op with players being able to connect with up to four units in the same store or other cabinets across Japan via the net. There are, of course, some changes. To start with, the four heroes from Left4Dead 2 have been replaced by new Japanese characters—namely a schoolgirl, an adventurous tour guide, a college student, and a bartender. As you might expect, all the dialogue in the game has been replaced with new dialogue from these characters. Instead of a joystick or gamepad-style controller, the game is controlled by a Razer mouse and what is basically the nunchuck attachment to a Wii controller. Movement, crouching, and jumping are mapped to the nunchuck while aiming, reloading, general actions, and switching weapons are handled by the mouse. Honestly, it plays well enough, even if the nunchuck feels a bit awkward to use. It just feels like an odd control combination for an arcade game. While the basic gameplay remains the same, there are some noticeable differences—i.e., zombies disappear as they fall to the ground so that no bodies remain and there is little to no blood when shooting or meleeing the undead hordes. However, the most obvious arcade addition is the counter in the top right of the screen showing your remaining time. When the counter hits zero, it’s game over. Initially, the maximum time on the counter is dependent on how much money you pay up front (with extra time bonuses for the more you spend). Of course, when time runs out, you can always save your progress on a special card—the cost an additional 300 yen (about $3). Also, as you play you can unlock new costumes and weapons which can also be saved on the card. So, in the end, the arcade game felt like I was playing a truncated version of Left 4 Dead 2. It really felt inferior in every way; and while I am interested in trying out the “special events” the game purports to have (as none were active while I was playing), I doubt I will ever feel the need to play it again despite the draw of the special events. In other words, you're not missing out on much if you take a pass on this Japan-only arcade title. Left 4 Dead Survivors was released in Japan on December 10, 2014.